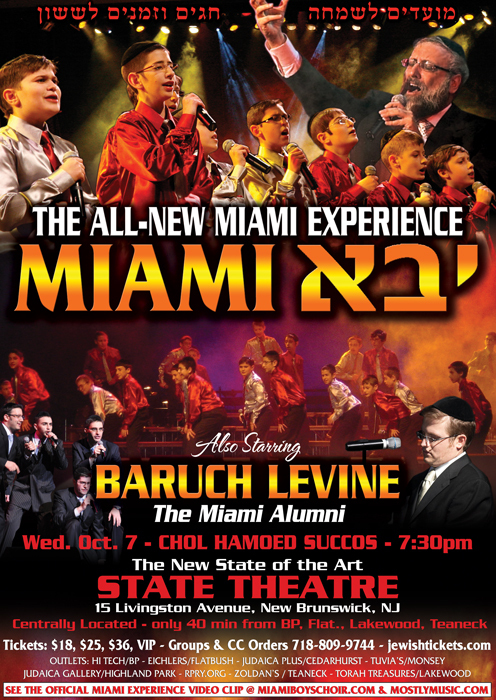 ALL NEW MIAMI EXPERIENCE WITH BORUCH LEVINE! FIRST TIME EVER! At the stunning state of the art, STATE THEATER in New Brunswick, NJ. A sound, stage, and lighting phenomenon! Only one, exclusive performance of the ALL – NEW MIAMI EXPERIENCE, MIAMI YAVOH in the NY/NJ area. Wed. eve. October 7, 745PM. Also starring Boruch Levine and the Miami Alumni. To purchase tickets go to JEWISHTICKETS.COM. See the spectacular Miami experience video clip!